Are you ready for some spring stitching? This round-up of hand embroidery patterns will certainly get you in the mood! From flowers to spring critters to fluttering friends and blooming branches, you'll love working on a new season of stitches. The Doodle Stitching books by Aimee Ray are filled with all kinds of delightful motifs, many of which are perfect for spring stitching. This blossoming branch is a free pattern that will surely whet your appetite for more of her designs. Although it's presented as a single motif, you could easily repeat the design to make a border, or even combine this with some lettering, such as a name or a welcome for spring! Aneela Hoey, author of Little Stitches, created this simple (and free!) springtime embroidery pattern. It would look beautiful stitched on a zipper pouch or a child's dress. The bright color palette screams spring, but the floral design would look just as sweet if stitched in colors that whisper spring instead. Amy of Nana Company always makes the sweetest things, and these free spring animal patterns are no exception. Along with the patterns for Wee Brown Bunny's Friends (a lamb and chick), you'll also find directions for making the sweet bags featuring Wee Brown Bunny. If you're a fan of folk-art, you'll love this blue bird pattern inspired by a vintage transfer sheet. The colors in the example are bold traditional folk-art colors, but you could change them to light or bright spring colors. And although this is a free pattern, the downloadable PDF is extensive. A full color and stitch guide is included, as well as a scan of the original vintage pattern. Plus, there are some unusual stitches used, making it a fun project for beginner and advanced stitchers alike! Florals reign in spring and this free spring word art pattern has a perfect scattering of tiny flowers. It's designed to be worked with satin stitch to fill in the letters, but if outlining with back stitch is more your thing, that works too. 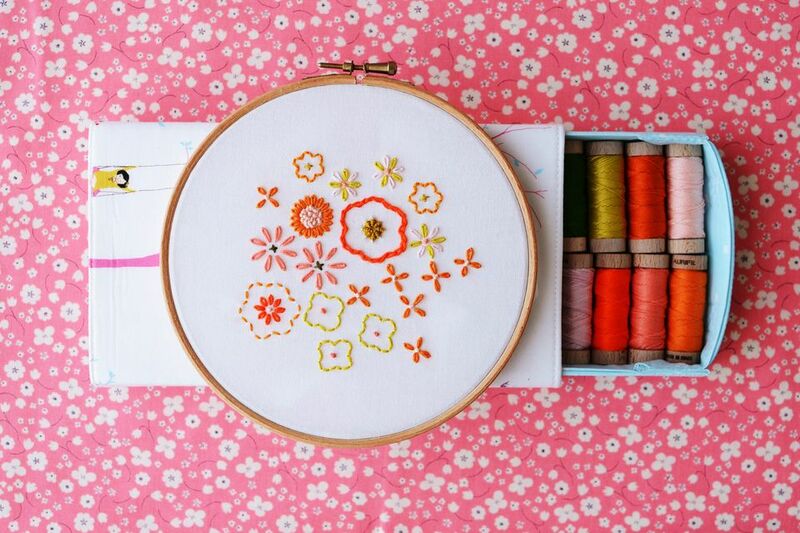 And all of the little flowers are easy to make with just a couple stitches! Can you smell spring? Between trees budding, rain showers and flowers starting to bloom, you can always tell when spring is in the air. Celebrate that with this beautiful embroidery pattern. The word Spring is created with leaves and flowers, plus there are a few extra elements too. Bustle and Sew also offers a free pattern of a bulb in a teacup. It makes a great companion piece to the Spring is in the Air design! Bev of Flamingo Toes offers this darling deer who is sporting some spring blossoms. Daisy the Floral Deer is just one of the floral animal patterns that she's designed. The stitching is simple enough for those who are new to embroidery and would make a great wall display as shown. You'll "bearly" believe the level of detail in this simple embroidery, but with Follow the White Bunny's pattern, you'll be able to stitch a charming spring bear just like this one. Because who could resist a furry bear dancing with an arch of spring flowers? Nicole also shares a free spring bunny pattern on her blog, which you won't want to miss! With this embroidery kit from Tamar Nahir Yanai, you'll be ready to pick up your needle and start stitching a very springy bird on a branch in no time. The pattern is simply adorable and the kit itself comes with printed fabric so you can skip the transfer step. Depending on where you live, you may see more butterflies in summer than you do in spring, but there are many spring butterflies. And with this pattern you can have them year-round! Sweet Pea Workshop's butterfly pattern incorporates beads and sparkle into the stitching and includes a little quote: "to rest atop a flower, sipping nectar for an hour."